The value I want to describe in this post (in a very preliminary fashion), is that associated with the quality or effect of visual ‘density’. I oppose this value to that of clarity or transparency, which is often an orienting one in public landscapes–not only for the sake of facilitating different aspects of its use, but also for security reasons (since a fully ‘legible’ landscape makes people who are using it in ways other than its ‘intended’ use easy to identify… and monitor or apprehend). These are landscapes wherein ‘the more you look, the more you see’. They tend to contain a relative abundance–or at least, a more complicated layering–of vegetative material, and also to be relatively free of external control (though not necessarily intervention). This does not however, presume diversity or complexity: a well-designed garden can present a diverse range of species, and produce complex visual effects, while also making everything clearly available to view. It is rather the number of plants, their form and growth habit, as well as the style of their juxtaposition with other elements, that produce effects of visual density. As a value, visual density is associated with specific circumstances, practices of appreciation and experiences. I treat each of these in turn (briefly, in broad brush strokes) as a way of elaborating its importance more clearly. Processes and circumstances producing visual density. Although I can’t claim any scientific authority in this regard, it would seem to me that, in circumstances where conditions are conducive (i.e., most importantly, adequate rainfall) all that is required to produce multiple layers of vegetative growth and an attendant density, is the passage of time, and the lack of external control over those processes. 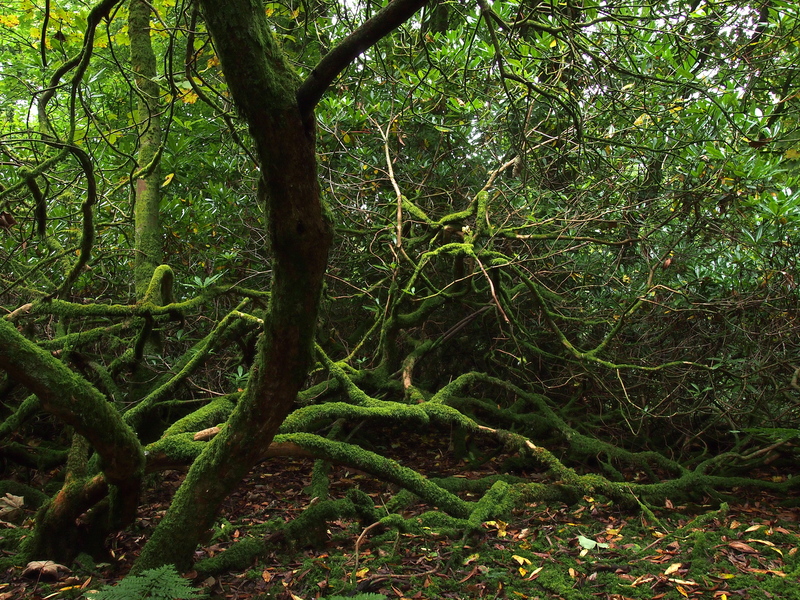 Of course some plants produce such effects much more quickly than others (e.g., the twisted, horizontal growth habits of Rhododendron), but growth in general tends to obstruct vision the more it proceeds unchecked. Appreciating visual density. In order to really see a landscape that has overgrown, you have to look more closely and more actively. Not only is a comprehensive survey from any combination of vantage points impossible, the visual quality of density stands in opposition to the model of vision implied in the survey (that everything can be made available to sight, more or less instantaneously): it foregrounds the impossibility of ever seeing everything, let alone at once, and in so doing, exposes the artificiality of any landscape that offers as much. 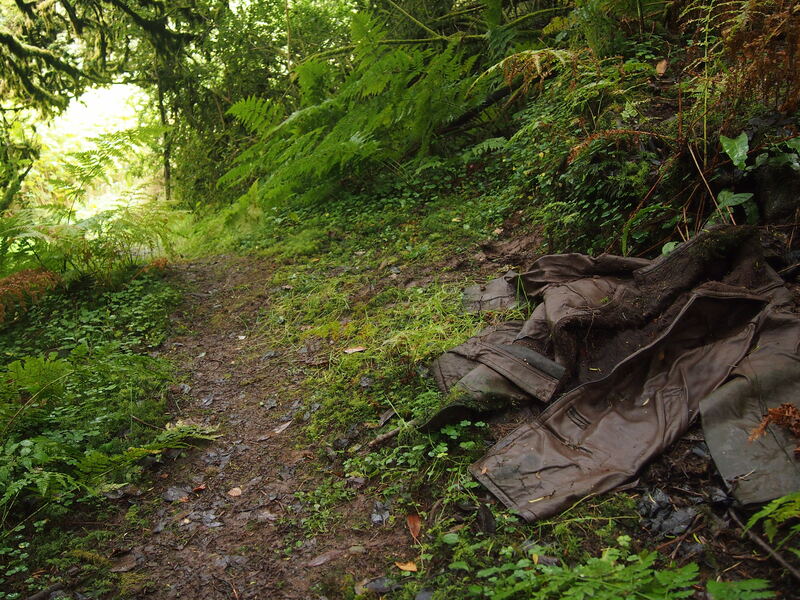 In an overgrown landscape, where the foreground seems a tangled, disorganized mess, the question of interest is not, ‘how does it look?’ but ‘what did you find?’ In other words, things have to be noticed in order to be seen, which implies an active engagement as opposed to a more passive reception of views. Experiences of density. A landscape that is visually dense or deep is one whose contents cannot be quickly assessed. Such landscapes frequently make people uncomfortable, especially in urban settings, where, as research in environmental psychology has shown, people often fear that excessive growth conceals persons or activities that are in some way dangerous. However, to the extent that such fears can be allayed–e.g., by visiting the landscape in the company of others–a visually dense landscape can feel wild or mysterious in a positive way, producing an experience of heightened awareness, which can be invigorating and is certainly rare, especially in cities. At the same time, by inviting different practices of looking, it provides an opportunity to experience the pleasures of discovery, and to practice noticing and identifying different plant and animal species, or the traces of natural processes and human intervention. As will be appreciated by anyone who has attempted to weed an overgrown garden, or locate particular species of plant in the wild, these activities require a perceptual attunement which it takes time and sustained effort to develop. This entry was posted in Uncategorized on July 16, 2014 by Erin Despard. As I work through this train of thought (see previous posts on “valuing neglected and unregulated landscapes”), I realize some clarification of what I mean by ‘value’ is in order. I want ‘value’ to encompass both specific aesthetic effects or qualities of landscape and the broader socio-economic and cultural relations implicated in them. For example, bright colours (or, at least, highly contrasting colours) are highly valued in contemporary urban gardens and landscapes. This is something that is easy to take for granted, but the horticultural valuation of colour and contrast is historically specific and has shaped not only trends of garden design, but the selection of species in cultivation by growers (though, admittedly, there is historical research still to be done to convincingly establish this claim). It is also associated with a preference in certain contexts (e.g., municipal, corporate, institutional) for annual (as opposed to perennial) plant species, which tend to require more water and chemical fertilizers than perennial species, and entail more waste (e.g., in the form of the plastic ‘cell packs’ in which they are sold). At the same time, colourful flowers and highly contrasting foliage are highly amenable to being photographed, which enables them to be incorporated in a broader visual culture (e.g., in lifestyle magazines, calendars, coffee table books and so on) that in turn helps to reinforce preferences for particular horticultural qualities and forms. Thus, as a landscape value, bright colour is reciprocally related to specific historical and socio-economic circumstances–its predominance is problematic because its suppression of other possibilities has much broader implications. 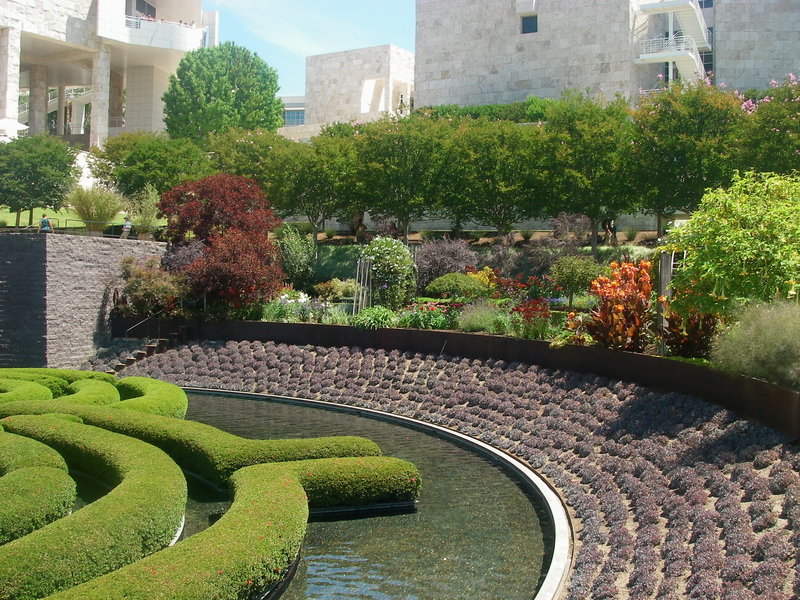 In this context, the search for and elaboration of alternative landscape values is a way of pursuing environmental and social change through cultural means. Or, to put that another way, of making landscape appreciation more critical. What are the qualities and effects associated with processes and circumstances that are environmentally beneficial and socially creative? I think that answering this question is a strategy for orienting intervention and communication in support of a greater diversity of landscape forms, uses and design processes in cities. This entry was posted in Uncategorized on July 15, 2014 by Erin Despard. 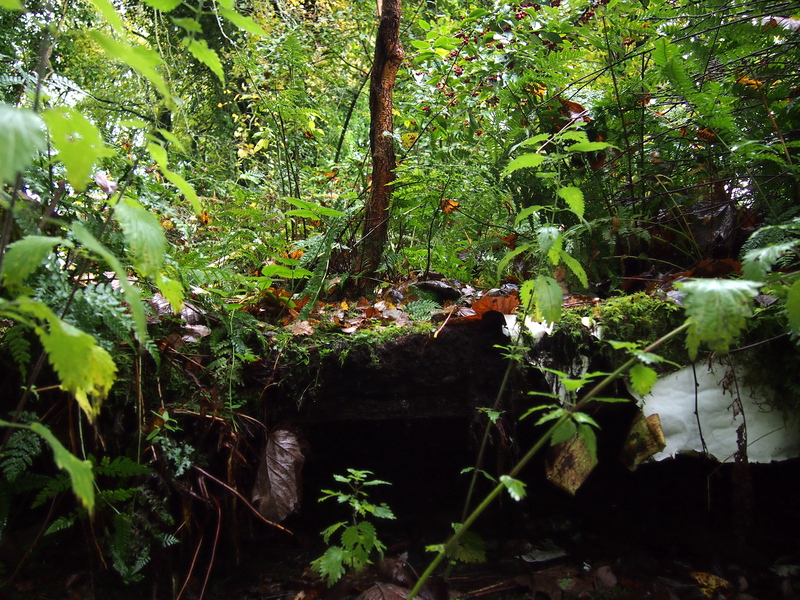 I promised in the last post to write about some of the more ephemeral, hard-to-specify values of landscapes such as Kilmahew and the North Kelvin Meadow. 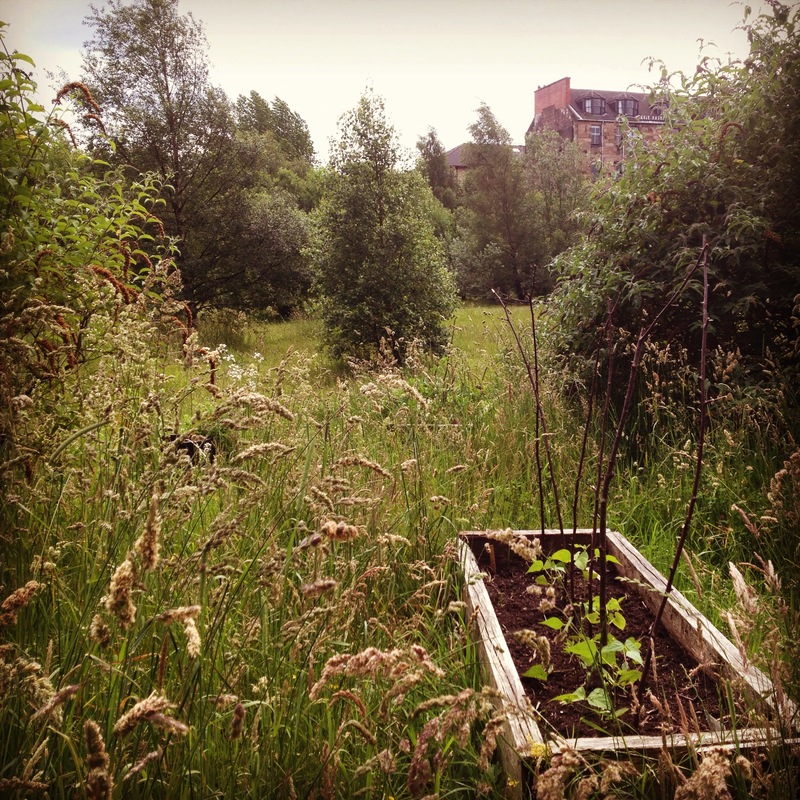 This is still to come, but in the meantime, I thought I’d share my representation to the Glasgow City Council over the development that is proposed for the meadow in the new City Development Plan. An attempt to specify the unspecifiable… for planners! “As a postdoctoral researcher in human geography, who also happens to live across the street from the Meadow, I have both personal and professional reasons to value this space in its current state, and to oppose the development proposed for it. I describe these reasons in more detail below. Living across the street from the meadow is literally the best thing about living in Glasgow as far as we are concerned. The last item on the list (exploratory play and nature education) is particularly important to me as a mother. Though my daughter enjoys a good play park as much as any toddler, she is at her most imaginative when we go to the meadow: creating spaces in the Children’s Wood where she can act out whatever scenario she dreams up, wandering through the long grass, hiding under shrubs, playing in the willow hut, and so on. It is exactly what she needs after her more structured day at nursery. In the course of these explorations, I am able to show her different plants and bugs, help her to identify the sounds of birds, and smell different flowers and herbs. Not only is this an educational opportunity not easily replicated in more manicured urban spaces, it amounts to very high quality time for us, since she can safely lead me where she pleases (without worrying about bicycles on the bike path, or getting lost in a crowd of people at the botanic garden, for example). Our enjoyment of the meadow as a green space has also led me to become actively involved in caring for it, which has in turn generated friendships, and participation by our family in different organized activities (e.g., composting, litter clean-ups, community gardening). I discuss the importance of these activities further below, but for now emphasize that this attachment to, and active participation in, the meadow has been crucial to us feeling happy, connected and at home in our new city. Biodiversity in-process. As a playing field unused for 30 years or so, the Meadow represents a unique site of ecological change. Here it is possible to observe biodiversity in process: as something that is still happening to the site, and which can be enhanced through human intervention, rather than something already achieved by nature, and for which the only human contribution is protection. The cultural as well as environmental value of such sites has been documented in a number of scholarly works recommending a more pragmatic, creative approach to questions of biodiversity (see examples below). As a researcher interested in relations between human beings, plants and non-human processes of growth and change, I have spent much time exploring the meadow, and the possibilities for enhancing its biodiversity (particularly in vegetative forms). Some of this work has been documented in preliminary form on my blog: http://www.communicativelandscapes.wordpress.com and will be incorporated in future academic publications of a more formal nature. I can report from my investigations that many new plants (at least eight but probably more) can be added to those recorded on the plant survey conducted in 2011. The Meadow is a site that is increasing in quantity and diversity of plant life every season. Most of these plants have arrived on their own, but some of them have been planted by community members. For example, several species of fern were transplanted there by a colleague and I this past fall, as an experiment regarding the means of enhancing processes of naturalization and colonization already in process. These ferns currently reside in areas of high traffic in the Children’s Wood but are, nonetheless, thriving. I view the Meadow as a site for continuing research into how community members might take on activities of tending semi-wild urban spaces so as to maximize biodiversity while maintaining high social, recreational and educational value. Social learning and innovation. There is a growing body of research in human geography and other disciplines of the social sciences that identifies the social importance of a contemporary ‘commons’: land and physical resources that are held in common among members of a given community, and managed collectively (see below for a couple of examples). Community managed allotment and collective gardens are a good example of such sites: through the process of figuring out how best to share collective resources, how to acquire support, resolve disputes and solve logistical problems, community members develop forms of social organization (not to mention friendships) that are valuable above and beyond the output of the gardens. A community that can manage its collective spaces is also one that can negotiate diversity, solve problems and provide support to its members in a variety of sustainable (because pragmatic and local) ways. Such spaces are particularly important in cities, where social ties are often otherwise challenged by cultural difference and mobility. I have recently started a dedicated Instagram account (@ilovenorthkelvinmeadow) as a means of documenting the changing landscape of the Meadow and its social and ecological vitality. The North Kelvin Meadow is an excellent example of an urban commons. Not only has it become the focus of a variety of innovative, extremely well-attended cultural and environmentally educational events, sharing its use has provided community members the means to address both ongoing local problems (with litter, dog fouling and vandalism), and larger societal issues around physical fitness, food security, social isolation and environmental engagement. The kinds of connection people make while participating in projects and events associated with the meadow are thus both culturally innovative and socially sustaining in profound ways. What is important to emphasize, is that the majority of these activities, and the capacities they have helped to generate, would not be possible without the space of the Meadow. As geographers Lynn Staeheli and Don Mitchell argue in their recent book The People’s Property?, building and sustaining community requires a physical space proper to that community: in the case of the meadow, an open-ended, semi-natural space provides the perfect focus for environmental learning and social empowerment. Clément, Gilles. (2007). Le jardin en mouvement. 5th ed. Paris: Sens & Tonka. Clément, Gilles (2006). “Working with (and never against) Nature.” In environ(ne)ment: manières d’agir pour demain / approaches for tomorrow, 90-103. Edited by Giovanna Borasi. Milano, Italy: Skira Editore. Marris, Emma (2011). Rambunctious Garden: Saving Nature in a Post-Wild World. Bloomsbury. Eizenberg, E. (2011). 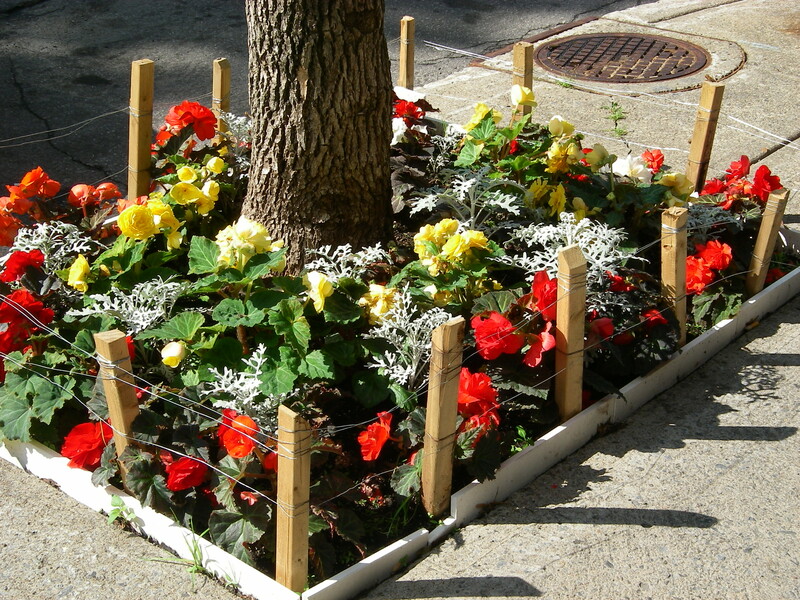 Actually existing commons: Three moments of space of community gardens in New York City. Antipode 44 (3): 764-82. Staeheli, L.A. & Mitchell, D. (2008). The People’s Property? Power, Politics, and the Public. Routledge. Tornaghi, Chiara (2012). Public space, urban agriculture and the grassroots creation of new commons: lessons and challenges for policy makers. In André Viljoen and Johannes S.C. Wiskerke, Eds. Sustainable Food Planning: Evolving Theory and Practice pp. 349-64. The Netherlands: Wageningen Academic Publishers. This entry was posted in Uncategorized on July 1, 2014 by Erin Despard.